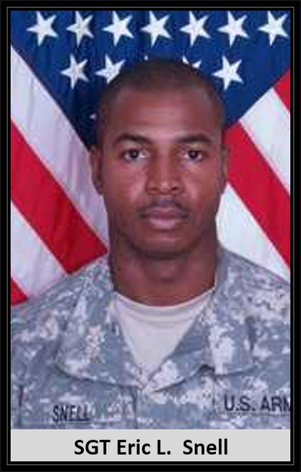 Hometown: Trenton, New Jersey, U.S.
Died: June 18, 2007 in Operation Iraqi Freedom. Unit: Army, 3rd Battalion, 61st Cavalry Regiment, 2nd Brigade Combat Team, 2nd Infantry Division, Fort Carson, CO. Birth: Jan. 18, 1972, Trenton, Mercer County, New Jersey. Sgt. Snell of Trenton, N.J., was a star baseball player for Hamilton High School West and later played at Trenton State College. He was good enough to be drafted by the Cleveland Indians in 1989. He was a member of Hamilton Little Lads, Hamilton Pal, The American Legion, Babe Ruth League, Hamilton Township Recreation Program, flag football, baseball, track, and basketball. Sgt. Snell was the 54th draft pick by the Cleveland Indians and later decided to play for Old Dominion University in Norfolk, VA. His professional baseball teams' affiliations included the New Jersey Pilots in the Atlantic City Baseball League. Eric was eager to jump to the pros, but his mother pushed him to consider college first and he graduated from Trenton State College in 1994. When his baseball career fizzled, he turned to modeling and then to the Army. He signed up for two tours in Iraq. He had talent, looks and brains. He also was a New York Male Model. He was later employed with Glorious Foods Catering Company of New York, AT&T Wireless Services. His awards and decorations include the Bronze Star Medal, the Purple Heart, and the Army Commendation Medal. 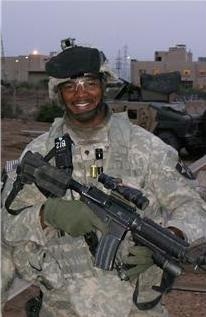 Eric died in Balad, Iraq, of wounds suffered when his unit came in contact with insurgents using small arms fire in Iraq at age 35. NJ Run For The Fallen, Inc. has been granted 501(c)(3) status by the IRS - EIN 27-3718089. Copyright © 2019 by NJ Run For The Fallen. Text, graphics, and HTML code are protected by US and International Copyright Laws, and may not be copied, reprinted, published, translated, hosted, or otherwise distributed by any means without explicit permission.